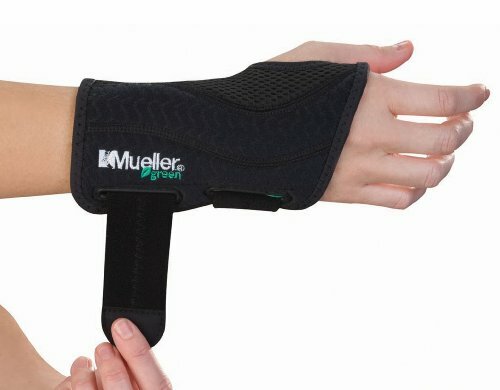 If you are in a hurry and want to quickly find out what the best carpal tunnel wrist brace is, we recommend Mueller Green Fitted Wrist Brace as the best one. What is the Best Wrist Brace for Carpal Tunnel? How Do Braces Help With Carpal Tunnel Syndrome? Carpal tunnel syndrome is a condition that can cause extreme pain, as well as other sensation problems, like numbness, tingling, or burning. This is different from other wrist conditions like sprains, tendinopathy, or arthritis, because the main culprit is actually a nerve, which is why it can feel so terrible without any apparent injury. These braces are not ranked in any particular order, as some of their subtle differences lend themselves to different applications, but nevertheless, we consider all of these to be good options in one way or another. Mueller Sports Medicine, found by Curt Mueller in 1959, is a highly popular and reliable sports medicine company that makes excellent wrist braces. This brace, the Mueller Fitted Wrist Brace, offers excellent value and can be considered as a great all-around carpal tunnel wrist brace, but is certainly capable of addressing pain and discomfort associated with carpal tunnel syndrome. This brace acts directly on the wrist joint, and while it does loop around your thumb for a secure fit, it still allows for full thumb and finger range of motion. This means it isn't good if you don't feel comfortable with a carpal tunnel thumb brace or any of your fingers to be fully stabilized, but if the issue is with your wrist, then it's definitely a good brace. The Mueller hand brace is made with soft breathable material (latex-free) that helps make it comfortable to wear for long periods of time. The material is created without the use of petroleum, the green inner lining is made of 67% percent recycled plastic PET bottles, and the Spandex binding is made from 73% recycled materials. This truly is a green brace! Furthermore, the material is antimicrobial, which helps reduce odors after heavy use, helps prevent stains, and increases the overall durability of the brace. This wrist brace comes in two different sizes: S/M and X/XL. S/M is meant for wrists 5-8 inches around (12-20 cm), and the X/XL size is meant for wrists measuring 8-10 inches (20-25 cm). It can be washed in cold water with mild detergent, but you should not use any bleach or fabric softener. You can't put it in the dryer, but it dries fairly quickly in the air. Overall, this is a really good wrist brace for lots of different conditions, especially conditions like carpal tunnel syndrome, where you potentially need to wear the brace for carpal tunnel for long periods of time. It offers excellent value at a very affordable price point, and the name behind the brace should instill some level of confidence in the product. Therefore, if you need a good all-around wrist brace that doesn't limit thumb or finger motion, the Mueller Fitted Wrist Brace should definitely be a consideration. M Brace RCA is an innovative and minimalist brace that has a much different design than your standard wrist brace. These sorts of designs for a carpal brace are just starting to hit the market, and we think that more and more of these types of braces will become increasingly available. This brace fits sort of like a watch, but rather than wearing it simply where it falls, you can adjust the location to provide carpal tunnel support where you need it most. We should say that it isn't just a strap either. The shape of this carpal tunnel brace provides relief for the median nerve while not limiting your wrist motion at all. Therefore, it should be noted that if you need to completely immobilize your wrist, this won't be the brace for you, but if you simply want to be relieved of symptoms while still maintaining a full range of motion, this could definitely be a good option. Due to the minimalist design, this is an extremely lightweight brace that weighs in at less than half an ounce. 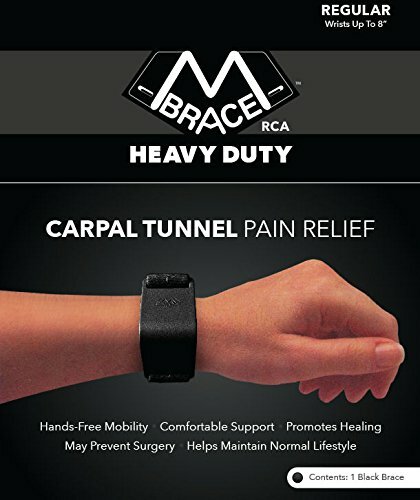 Combined with the fact that it's meant for all-day or all-night use, this night brace for carpal tunnel will allow you treat symptoms while still being able to rehabilitate the wrist with any passive or active exercises that may have been prescribed to you by your doctor or physiotherapist. Overall, M Brace RCA can be a great carpal tunnel brace for typing, to address pain and discomfort. Even if you have just started noticing symptoms, for example after a long day of typing on the keyboard, this can be used to mitigate the negative effects of repetitive motions on the wrist. Moreover, it doesn't completely immobilize your wrist, in fact, it allows for a full range of motion, so you can use it as a wrist brace for work or for activities that involve movement of the wrist. While it's a little more expensive, especially for such a small design, it's can be effective. The ActiveWrap Heat/Cold Therapy Wrist Brace looks a little more bulky than your standard wrist brace, but there is a good reason for this. The brace comes with two reusable gel packs that can be frozen or microwaved to provide heat or ice therapy. The packs fit conveniently on the inside of the brace, allowing you to wear the brace while treating your wrist with heat or ice at the same time. Lots of people like it for carpal tunnel syndrome due to the added influence of the heat/ice packs. Furthermore, the simple design of this wrist brace lends itself to ease-of-use, and yet the level of compression is still highly adjustable due to the Medical Plush material. When combined with heat or ice, this means that the heat or ice can be applied directly to wear you need it most. You don't have to use this wrist wrap for carpal tunnel with the heat/ice packs all the time. They can simply be removed and stored in the freezer (ice) or room temperature (heat) for later use. In this manner, the carpal tunnel braces will naturally slim down a bit while you wear it, relative to when you have the packs in, so it can still be used as a standard compression and stability support for carpal tunnel, especially throughout your daily activities. Overall, this is a really interesting wrist brace because the design is fairly simple, yet well-thought out enough that it's still convenient and effective for many different injuries or conditions, even though you may not see lots of these around. Therefore, if you know you will be needing a wrist brace for for carpal tunnel syndrome at least for a while, and especially if you know you can also benefit from heat and cold therapy, then this is one of the top braces in that regard. The CopperJoint Wrist Support is your standard compression sleeve, but a little bit thicker. To be clear, this wrist compression sleeve provides little to no support/stability for the wrist, so it will permit full motion in flexion and extension. Its primary purpose is to provide mild compression to the wrist area. This product markets the therapeutic effect of copper infused fabric. The thought here is that the release of positive ions facilitates health and well-being, but this notion is still highly debated with no definitive proof that a copper bracelet for carpal tunnel works in this manner, or at least to an extent that is noticeable. However, the copper-infused fabric does have one clear benefit: It is more effective at killing bacteria, and therefore, these anti-microbial properties increase the odor-resistance properties of the brace, which is a highly convenient factor that could be worth something to lots of people. While the market this brace as being "breathable", compared to the other braces we reviewed on this page, it's not very breathable. This is partly intentional, as part of the brace's purpose is to provide therapeutic warmth to the area, which can help alleviate pain. However, if you're participating in activity, this can cause a build-up of sweat. The copper does counteract the resulting bacteria and odor from the sweat, so it becomes a comfort issue at this point. Overall, this is an interesting wrist brace that can be used for carpal tunnel syndrome, as it provides compression to the wrist. Just remember, it doesn't splint, stabilize, or immobilize the wrist, so if this is required in your treatment, then you may want to look elsewhere. However, if you simply want a little added compression to help address the pain, while still maintaining full flexibility and being able to play sports like golf or tennis, then this could be an excellent option. 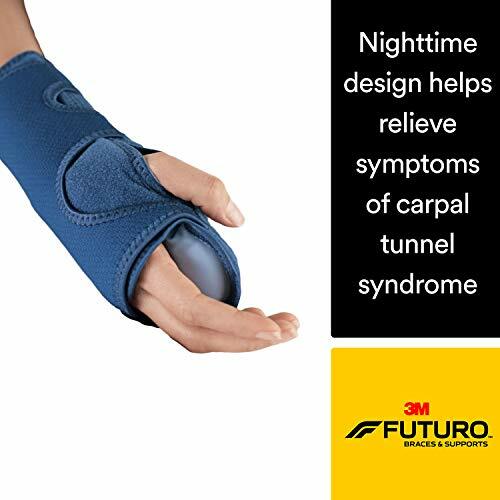 Futuro Nighttime is a night wrist brace for carpal tunnel that is meant to be worn while you are sleeping. It provides moderate adjustable stability, as there is a removable palmar stabilizer. This is great to prevent excessive motion of the wrist, or long periods in an undesirable position, by keeping the wrist in a neutral position at all times. The material is quite soft and does have some moisture-wicking ability, helping to keep you dry and cool, which can be an especially important feature if you want to make sure you will get a good night's sleep. The adjustable straps can be used to further optimize comfort, and in addition to the removable palmar stabilizer, there are cushioning beads that help add additional support and light compression as carpal tunnel braces for sleeping, ultimately reducing pain. The beads we speak of are contained within a small bag, and this entire cushion sits near the palm, which can help prevent your hand from curling into a fist while you sleep. Additionally, the brace itself has two thumb holes on either side of this cushion, meaning that the same brace can be used for the left or right hand. The only real disadvantage to this brace is the fastening system. At first, it works perfectly well and is a nice design, but if your particular brace fits rather tightly on your wrist and hand, the material involved in the connection can fray over time. If this occurs, your brace may end up popping off in the middle of the night, making it much less effective, even though the rest of the brace is totally fine. All this being said, if you are aware of this issue ahead of time, you can simply monitor the fastening system over time and seek customer support if it does actually become an issue. 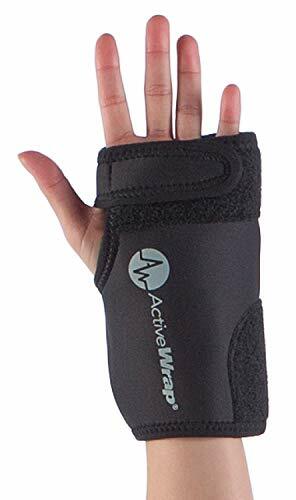 Overall, this is a great brace to help with carpal tunnel syndrome, and is primarily meant to be worn while you sleep. It stabilizes the wrist, immobilizing it in some directions (e.g. flexion, as long as the palmar stabilizer is used and beads haven't been compromised), and providing some compression for pain relief. Then, if you have prescribed exercises or stretches, you can still perform those activities in the day, thereby maximizing your chances of successful carpal tunnel treatment. This is a great all-around wrist brace that provides excellent value. Form-fitting and comfortable, the Mueller hand brace is for many conditions, and very affordable. Innovative and minimalist design. Maintains wrist support for carpal tunnel syndrome without limiting any other movements. Simple wrap-around design for adjustable compression. More breathable than neoprene, and comes with removable aluminum carpal tunnel splints. This is a combination of a wrist brace and a heat/ice pack (comes with two heat/ice packs). Provides good and comfortable support while still allowing thumb and finger mobility. 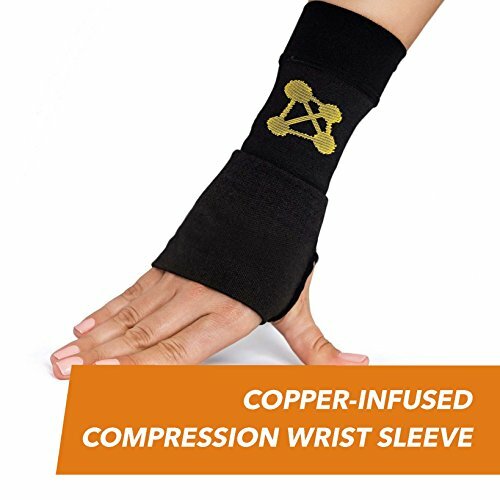 Copper-infused breathable support that cradles the wrist and comes with a wrist stabilizing bar for stability and alignment. Adjustable compression. One of the best wrist support for carpal tunnel, this sleeve slips onto the arm to provide compression to the wrist area. Not as much for stability, so it allows a high range of movement while applying compression. Meant primarily as nighttime carpal tunnel braces, Mueller provides rigid wrist brace support above and below with lots of cushioning, while still allowing for full circulation. Neoprene adjustable wrist brace that has a gel cushion in the palm for extra support, making it an ideal brace. Comes with contoured carpal tunnel wrist splint for stability. Meant to be worn while sleeping, this wrist brace combines light compression with support from cushioning beads and removable palmar stabilizer. Can be worn on left or right wrist. Lightweight low-profile design that offers a nice anatomical fit (pre-shaped into neutral position). Plastic with removable lining makes it easy to clean. The shortest way of describing carpal tunnel syndrome is that it is a pinched nerve in your wrist. To be a little more precise, it's actually the median nerve that becomes impinged. So how and why does the median nerve become impinged in this area, and not so much anywhere else in the arm or hand? The main reason is due to the amount of structures in this area that need to pass through the wrist from the arm to the hand, and area known as the carpal tunnel. You can consider the "walls" of the carpal tunnel to be the bones of the arm and wrist, as well as the ligaments that connect these bones to each other. A lot of structures need to pass through this very small space in the wrist, including the nine tendons of the forearm muscles that go to the fingers. 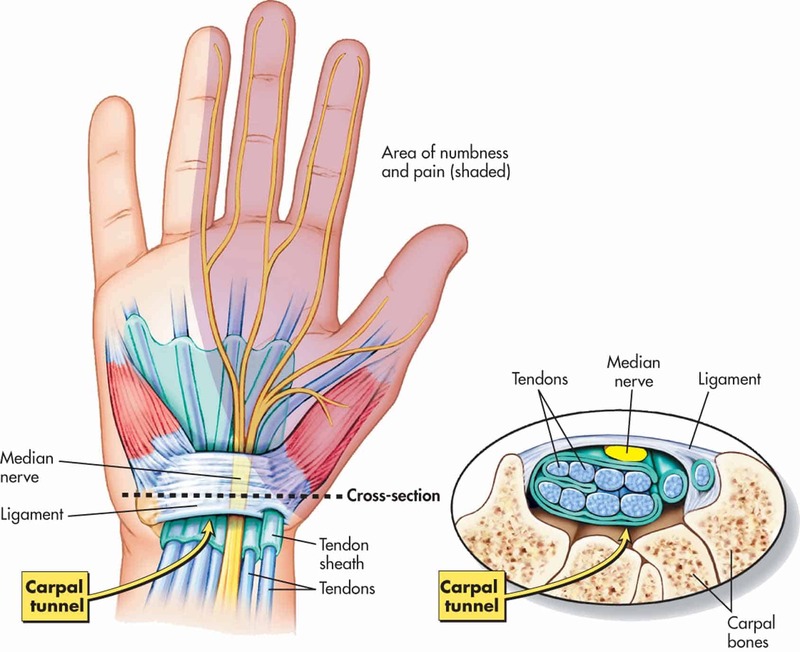 The median nerve also has to fit through this space, and normally there is no issue, but if the area becomes compressed, it can lead to the nerve becoming compressed or pinched, which is the source of the pain, numbness, or burning. In most cases, especially if you treat it quickly, it can be fairly easy to treat and come out with basically no real damage to the nerve. Given why the nerve is more susceptible to being compressed in this area, it may be no surprise that one of the best forms of treatment is to maintain the opening of this space so the nerve has relief from compression. In other words, you could consider the nerve as being suffocated, and you are trying to create space to let it breathe.The suffocation is due to swelling of surrounding tissues causing pressure on the nerve, so we have to somehow relieve that pressure. Check out this simple, yet effective, tutorial on carpal tunnel syndrome brought to you by Nucleus Medical Media. There are many factors that can predispose you to carpal tunnel syndrome. While we can all learn about general anatomy from a textbook, there is always variation between individuals, and some people just have a structural wrist anatomy that naturally makes them more prone to developing it. Another somewhat-related factor is heredity. Those who have a family history of it seem to be more predisposed to it. Other factors that can increase your risk of include diabetes, hypothyroidism (hypo = less active), and obesity from a young age. Additionally, it has been observed that pregnant women seem to have higher incidences of it, but the reasons for this still remain a mystery. Lastly, repetitive stress is well-known to cause. This is also the most well-known cause among the general population, likely because it has been recognized that this type of repetitive stress can be largely prevented, or at the very least, the negative effects can be mitigated. Repetitive stress can include anything from constant typing on a keyboard or using a computer mouse, repetitive motions during sports like tennis or golf, or any physical labor that involves repetitive movement of the arm, wrist, and hand (there are specific wrist braces for typing indeed). It is difficult to prevent carpal tunnel syndrome because the symptoms often develop very gradually. However, once they are recognized and diagnosed, then you can treat it and apply prevention methods to mitigate any further pain or discomfort.Just don't wait too long because if you let it go untreated for a really long time, you may end up causing some permanent damage to the nerve. Given that it involves a nerve, it can often feel really weird and painful without any noticeable cause. Nerve pain in any region of the body can be extremely painful, and can range in a variety of feelings, from a sharp pain, to an ache, as well as burning, tingling, and numbness. You may also experience weakness of the hand and wrist, as the median nerve may become unable to provide full motor sensation to all the muscles it's supposed to supply. Wrist braces can help resolve carpal tunnel syndrome in a few different ways. The most common method is by applying compression, which is more effective at relieving the pain as opposed to the actual condition itself. It used to be thought that compression was one of the best methods for treating carpal tunnel syndrome, but it is becoming more clear that it is better for symptom relief, which is still quite useful. Another reason a brace can help is they will immobilize your wrist while you sleep. By placing your wrist in a neutral position and keeping it stable while you sleep, you can keep the carpal tunnel open for the median nerve, which effectively gives the nerve half a day, everyday, to heal itself. This will result in less pain throughout the day, and is definitely a good way to kickstart your recovery. Some braces for carpal tunnel syndrome can also keep the carpal tunnel open while you go about your normal day-to-day activities. For example, the M Brace RCA Carpal Tunnel wrist support brace that we reviewed above is a great example of this. The brace won't limit your range of motion, allowing you to keep you joints moving and sufficiently perform the activities that you need to do, all while providing relief on the median nerve and letting it heal. Combining a nighttime brace with an active wrist brace is a great way to alleviate pain and discomfort and to allow the nerve to heal, ultimately treating the carpal tunnel syndrome altogether. Besides wearing a brace, other treatments include non-steroidal anti-inflammatory drugs (NSAID's), corti﻿sone﻿ injections, and surgery. Obviously, it's best to avoid surgery if possible, but if the condition has progressed too far, it may be necessary. Carpal tunnel syndrome can be an extremely painful, annoying, and frustrating condition. The more you know about it and how to wear carpal tunnel braces, the better you will be able to address the associated symptoms and treat the condition. Wrist braces can be extremely helpful, and the carpal tunnel wrist brace reviews above are all good choices for various reasons. In order to know exactly which one is the best brace for carpal tunnel syndrome for your individual needs, we highly suggest speaking to your doctor or physiotherapist (those able to assess your wrist in person), so you can optimize your selection accordingly. Good luck!